From the Dr. Seuss collection by Vandor. 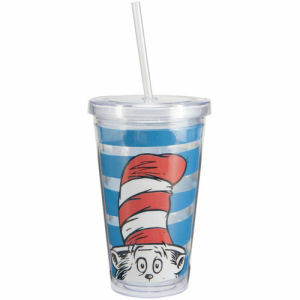 Dr. Seuss Cat in the Hat 18 Ounce Acrylic Travel Cup. This Item is in stock and ready to ship. You should not postpone your purchase and miss out on adding Dr. Seuss Cat in the Hat 18 Ounce Acrylic Travel Cup to your Dr. Seuss collection! From the Dr. Seuss collection by Vandor. Dr. Seuss Cat in the Hat 18 Ounce Acrylic Travel Cup. Double wall acrylic travel cups come with a straw and are BPA free. They are perfect for hydrating on the go, and the double wall keeps drinks cold! Hand Wash.